By the 1930’s the brand was big enough for Mario Dal Molin to start considering sponsoring a bicycle team so his companies name could be seen alongside other brands such as Legnano and Bianchi in the top races around Europe. The Second World War put paid to any such thoughts but when hostilities officially ceased he had already decided that sponsorship was the way forward and he got ready to launch his team. The factory produced a high speck racing bike and riders were put together. So in the Autumn of 1945 a new racing bicycle and top cycling team were born and they both carried the name Wilier-Triestina. Dal Molin was a proud and patriotic Italia, the Triestina part of the name is a reference to the city of Trieste which lay on the border between Italy and Yugoslavia. Who the city belonged to was always often a dispute through history and this was now even more the case after the Allies won the war. 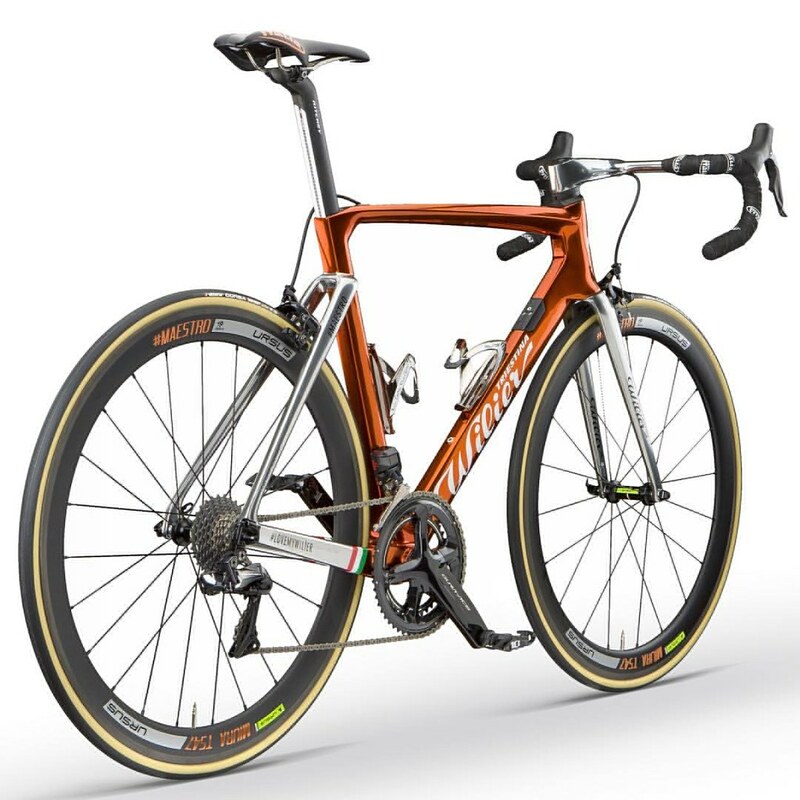 Dal Molin must have been delighted when it was pointed out the Wilier was a kind of acronym for the well known phrase “W l’Italia liberata e redenta” which means Long live Italy, liberated and redeemed. The city of Trieste, being a beautiful and prosperous trading port on the Adriatic Sea has been a much sought after territory throughout history. It was for long periods part of the Austrian Empire and when the Wilier bicycle company was founded in 1906 the Austro-Hungarian Empire was using it as a base for shipbuilding. During this period, just over 30 years after the unification of Italy, the Italian people were keen for new territories and Trieste would have been a fine place to take into their realm. At the start of the 20th century the city was a mix of Italians, Slovenians, Austrians and Jews. A proportion of this population were writers, intellectuals, entrepreneurs and artists. So when Italy was given land as a ‘reward’ for entering the First World War on the side of the Allies they were delighted that Trieste was included in the deal. The majority population of Italians would have been happy with this outcome but the large number of Slovenians were now cut off from the newly formed country of Yugoslavia. Worse was to come for the minorities of Trieste from 1922 after Benito Mussolini turned Italy into a fascist dictatorship. There was a ban on non-Italian languages, ‘Slavs’ were forced to Italianise their surnames and Slovenian shops and offices were attacked by Black Shirts. Italians weren’t exempt from persecution though as free thinkers and those with socialist sympathies found their civil liberties began to get eroded. The repression reached its zenith during the Second World War when the Nazis set up their only concentration camp on Italian soil in the city. In a rice mill called Risiera di San Sabba Slovenian and Ialian anti-fascists were tortured and 5000 were killed, some being gassed and having their bodies burned in ovens. Many Jews in the area passed through the camp on their way to Auschwitz. In May of 1945 Josip Tito and his partisans liberated the city from the Nazis and it was the Italians turn to find themselves being the wrong nationality. Many were deported or killed until the Allies took control of the city in June. Their reason for occupying the area was geographical, it stood by the soon to be established iron curtain, but the move brought some relative peace and safety to Trieste’s inhabitants. By 1946 it was decided that the area around Trieste was to be divided into areas controlled by either the Anglo-American or Yugoslavian military. The Giro d’Italia organisers, planning the first post-war race, were keen to promote the idea of a new Italy for their 1946 edition. An Italy that was free from the shackles of fascism and was now looking forward to a better future but also one that was united. So the 1946 race was cast as ‘The Giro of Rebirth’ and would include a stage finish in the city of Trieste. This was a perfect opportunity for the newly formed Wilier-Triestina team and Dal Molin set about assembling a strong squad for the race. Patriotically he chose riders only from Trieste or near Bassano del Grappa. The captain would be Giordano Cottur. He was born in Trieste when it was still in Austro-Hungarian hands. One day after his first birthday Italy had declared war on the Empire and he always considered himself Italian. Cottur was a very talented stage racer, he finished 3rd in the Giro three times during the era of Coppi and Bartali, and he kicked off the 1946 race in excellent fashion by winning the first stage between Milan and Torino. It seemed like he was in good form and would have every chance to take the twelfth stage into his place of birth while wearing his team kit emblazoned with the halberd, the symbol of his city. But would he even get the chance to go for victory? On the eve of the race the Allies declared that they would not allow the race to enter their territory. The situation in the city was still very tense. Football matches were banned and it was felt that the gathering of big crowds to watch the end of a Giro stage could ignite into riots and violence. So as it stood after Cottur’s opening stage victory the Trieste stage would actually be ending in Vittorio Veneto. Cottur’s stage one victory and the organisers insistence to the Allies that the Giro d’Italia would be a unifying force rather than something that would provoke disorder meant that the Allies eventually caved and a week before stage 12 they said that Trieste could stage finish after all. The 228 km route started from Rovigo and things were going along as a normal stage would until the race entered into the Allied controlled territory, called Zone A. From here the race was far from ordinary. The 46 riders (of the original 79 who set off from Milan) had to carry special passes to get through checkpoints and near the town of Pieris, around 40 km from Trieste, their lives suddenly were at risk. They came across an obstruction in the road which forced them to stop and when they did they were bombarded by stones thrown from the surrounding fields. The riders, including Coppi and Bartali, took cover in ditches and cars and one of their number, Edigio Marangoni of the Milan-Gazzetta team, was quite seriously injured and even feared dead. Accounts of the incident are patchy and sometimes contradictory. There were reports of shots being fired at the attackers by the people guarding the route and some even said the riders had to dodge bullets themselves. Nobody claimed responsibility but the blame was put on Slovenians and ‘Slavs’ and when news of the event reached Trieste Slovenian shops were ransacked and set on fire and riots broke out. The attackers managed to escape through the fields and were never caught and the motive was unknown but there was evidence that some Italians were involved. A few days of rioting in the city followed but the City and the rest of Italy soon wanted to get back to normal living and perhaps it was the Giro d’Italia which showed how that could be done. Previous Previous post: Giro 100. Cima Sappada And The 1987 Giro.